Whether you are a team leader, or team member, working in or on a team is important to compete in the current marketplace, and will become more important each and every year! You need to be on a team, and don’t limit yourself to local teams, make sure you’re looking into expansion teams as well. Obviously, there is the “casual” team. This is where one person goes up to another person and says, “Hey, let’s work together.” This is a partnership, and it is the weakest form of business. It’s challenging, especially in real estate, because one person usually ends up working more and a bitterness begins to set in quickly. These are the people who are game on, serious, investing money, and going to crush it. They are putting their time, effort, energy, and dollars into success. They are segmenting work flow and hiring people like buyer’s agents and listing agents that go out and work with buyers or sellers. You may not want to work solely with buyers or solely with sellers, and that’s fine. You can work with both if you’d really like to. But here’s something to keep in mind: the best of the best in every industry are the people who are specialists. Not just in real estate, but in everything. Look at the medical fields. General practitioners are not the ones that make all the money, it’s the highly specialized doctors that do. It’s not your regular dentist that makes the money, it’s oral surgeons, it’s orthodontists. Only the highly specialized people in every industry make the BIG money. Now, you need to get that workflow segmented so that every single person on the team can do what needs to get done. 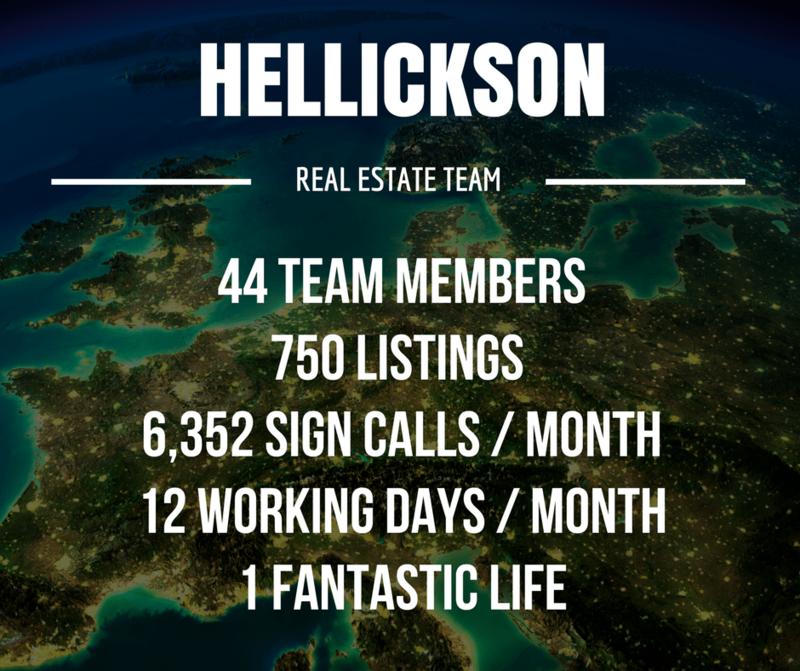 When it comes to listing agents, I want to know that if I’m sending you a listing lead, you’re going on ten appointments this week, that you’re good at working with those sellers. Why? Because you do it all the time! You’ve got a script down, you’ve got a checklist you follow, and you’re doing it over and over again all the time. This way, I know you are likely to set the listing, and I am likely to get paid! 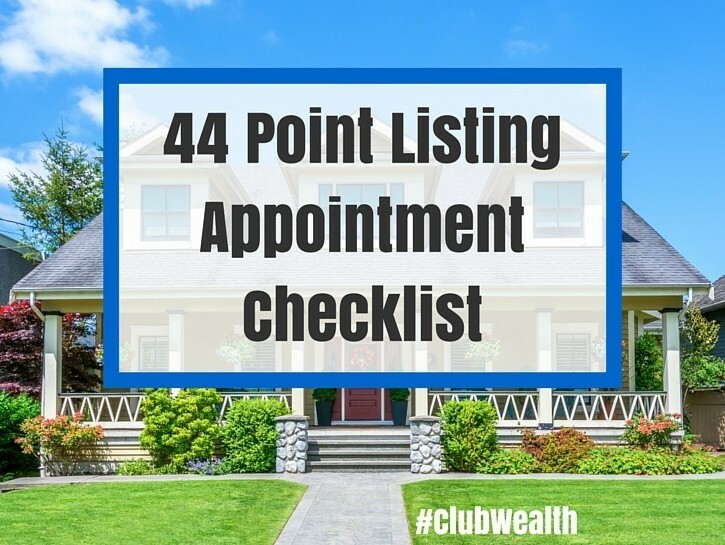 Check out the blog on the 44 Point Listing Appointment Checklist. Get the FREE download for examples of hiring ads. 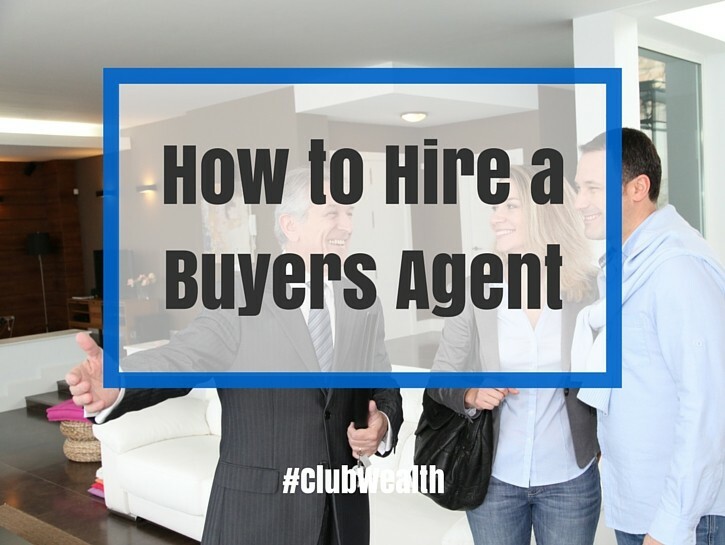 Another big thing for real estate agents: don’t hire just one person per role. You need to have multiples. If I have just one, and they’re having a bad week or month, that’s bad for the company. It means your company is then having a bad week or month. NOT GOOD! But if I have two or more people in the same role, they’re competing and they’re both working hard. They’re motivating each other and now, they’re each more productive for me and for the team. It’s good for them, it’s good for the team, and it’s good for the business. You’ll also need a bookkeeper or an accountant at some point. For a smaller team, you can use QuickBooks Self-Employed. For a larger team, expand to the full software; it’s well worth it. If you’re a team leader, you’re going to need attorney. They don’t have to be on staff, but they should be available to you on demand. The most important thing to remember as a team leader, you work for your team members, not the other way around. By providing tools and resources to them, you are removing any roadblocks that are preventing them from becoming as successful as they could be. Not only that, but remember there will be things you need to pay for, sometimes long before you make a profit, and you need to be prepared for that. There will be bad months, and you need to be prepared for that as well. That way, during those bad months, you can still make payroll and your team doesn’t implode. You should be expanding once your team grows to a certain level. You should be expanding into other markets. For example, if I was based in Seattle, I’d consider expanding into Bellevue or Tacoma. Don’t jump straight from Seattle to New York. You want to grow out from your center of strength. If you grow from your center of strength, you have that support hub everybody needs, and it’s far easier to hire, train, and lead your new agents! 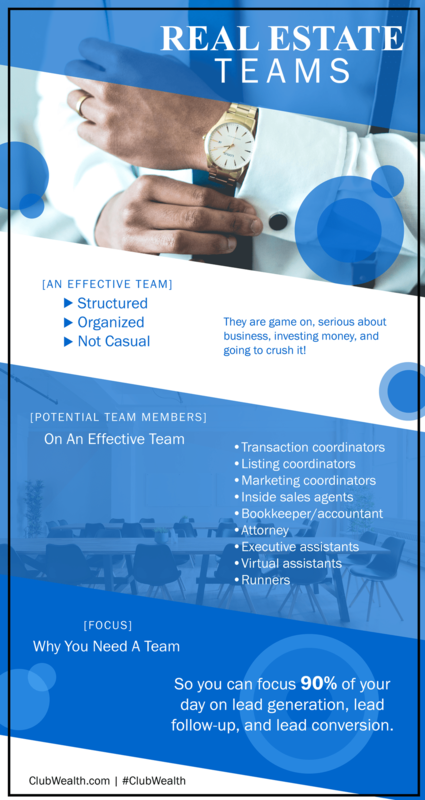 When should you be building your team? RIGHT NOW. Teams are rapidly taking over the country and the race is on. There are teams in every major market in the country. You need to be thinking about what you need to do to stay a step ahead. You need to remember to focus 90% of your day on lead generation, lead follow-up, and lead conversion. If there are no teams available, you can build one from the ground up. This requires a lot of effort, work, money, and perseverance, but it can be rewarding. If you’re looking to join a team, you can interview the ones in your area, or you can join one of our nationwide expansion teams. Reach out to us! 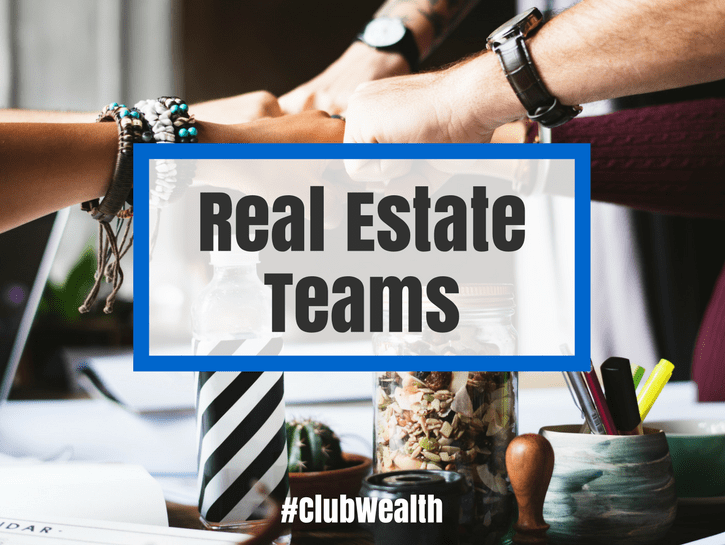 Call our office at (206) 300-1000 or email us at ClientCare@ClubWealth.com. Facebook is also a great way to reach out to us.